During the pilot workshop in Helsinki the participants collected personal memories related to public spaces. Here you can see some examples of them! The sculture reminds me of childhood. I see it everyday. I first saw it when I was 5 years old. ​This statue is by a school in Käpylä. The characters get backbacks every spring when the school ends. If I remember correctly they also get garlands. 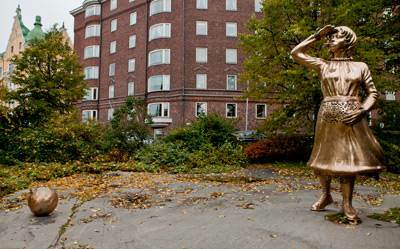 I moved from childhoods home to the red brick building behind The Waiting statue. For me the statue symbolises waiting in many ways. It reminds me of time when adulthood was just beginning.